One Monk Miniatures has a new paper mini available over in their webshop. This one's the Chimera Hybrid Cannoneer. One Monk Miniatures presents a brand new big alien bug with huge guns to not only squish your opponents troops but also to turn their armored units into scrap metal! 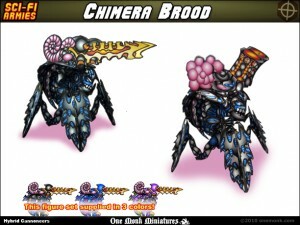 Three colors to match the older Chimera:Hybrid lines, two big gun options, three-inch circle bases with both grassy and wasteland textures, and a bonus page of weapon arms for more bitey-slashy fun. This model also comes with a 15mm scale version and automated cutting files for both scales.